Swedish visual and performance artist Tobias Bernstrup looks like a 21st century Klaus Nomi. His visual work is presented at exhibitions world wide. Next to that he is a gifted musician. He is able to create extremely catchy synth /elektro pop tunes while never crossing the line of delivering overproduced tracks. The sound of his tracks is like a hybrid of the arty side of Klaus Nomi with the pop side of Pet Shop Boys. 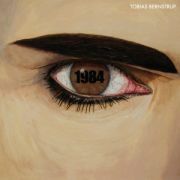 This 4 track EP is built around the theme (and title track) ‘1984’. But this theme is extended and made up to date. The Orwellian theme of total state control in which civilians are constantly watched and reality is manipulated is probably more actual as ever. 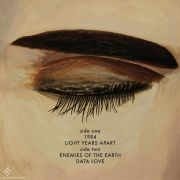 This central theme is given a more individual and neo-romantic touch with the track ‘Light Years Apart’, while the hostile state aspect is getting more of a sci-fi interpretation in ‘Enemies Of The Earth’. Closing track ‘Data Love’ combines the Orwellian sentiments of loneliness with the more contemporary vision on modern mankind of Houellebecq. The cover sleeve consists of two paintings by Tobias Bernstrup himself and fits the central theme perfectly. Despite the rather serious theme of the record this EP features simply excellent decadent music for the dancefloor. It combines elements of classic synth pop, elektro, EBM, italo disco and laser dance. There is no escape… you will have to love it!